Habitat: Some may emerge in fast water areas, but they seem to prefer somewhat slower water. Water Temperature: Emergence often commences as temperature approaches 62 degrees. Emergence can be scattered and sporadic, though more concentrated emergence tends to happen early in the morning during heatwaves. 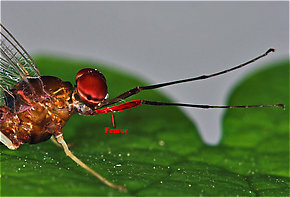 Female spinners often drop their eggs above the water. Action can be fast when large concentrations of spinners fall at twilight, but the spinner fall often concludes in darkness. Femur: The main segment of an insect's leg close to the body, in between the tibia and the trochanter. ), and towards the tip of the abdomen. These pale areas can be bright green on blackish-olive nymphs and yellow or orange on brownish nymphs. The pale area near the tip of the abdomen sometimes takes the form of three small spots in a triangular arrangement. Standard "BWO" patterns in #16-18 can work well for fish that rise to emerging duns. Freshly emerged duns are light olive and darken rather quickly to a dark dull olive or olive brown. Spinners are a very dark olive, often nearly black. Fishing an imitation of the nymphs can be productive before, during, or after the emergence. Smaller trout often focus on more numerous Tricorythodes or Baetidae mayflies, but some of the larger trout may prefer the lata nymphs. The D.Lata emerges in Michigan waters at 10 AM on the dot and stops at noon from about June 25 thru July 10. I have fished this hatch avidly for years and find it very punctual on moderately overcast days. Sunny days make it much shorter duration, about 30 minutes. A size 14 imitates it perfectly with dark dun wings, bright olive green body and med dun tails and legs at emergence. The body color does change to dark green after a while. The D.Lata also is significant in PA Northern Streams in Mid May. I have not encountered it in the South Appallacian streams as yet. I fish some smaller BWO (#16-20) in NC but none so large as D. Lata.